At 6' 1" and 160 well-conditioned pounds, the very athletic Madison is making a fantastic impression on fans in her homeland of Australia. But, she's also been noticed by fans and wrestling insiders alike here in the United States after her impressive showing during an OVW tryout in early 2003. An all-around athlete who has competed in diving and gymnastics, Madison was also a professional Life Saver working on the beaches of Sydney. It shouldn't be long before Madison's ring popularity crosses the wide Pacific! Madison Eagles: over six feet of well-conditioned female wrestler! A determined Madison heads to the ring. So much for rules! Madison rips the eyes! Eagles is one of Australia's top female wrestlers. How It Started: I loved wrestling from the first time I saw it! And that's all it took for me to aspire to be a wrestler. Before I was old enough, I started training at IWA in Sydney, Australia. But I quickly headed overseas a few times to train and do shows. Gimmick: A hard hitting, tough-as-nails chick who doesn't take crap from anyone...and backs it up! Wrestling Style: I'm a bit of everything mixed into one. It usually depends on the match and opponent. I combine high flying with strength, technical and old school. Gear: Skirt, kickpads and a hot little top. Titles Held: Three-time IWA Women's Champ. 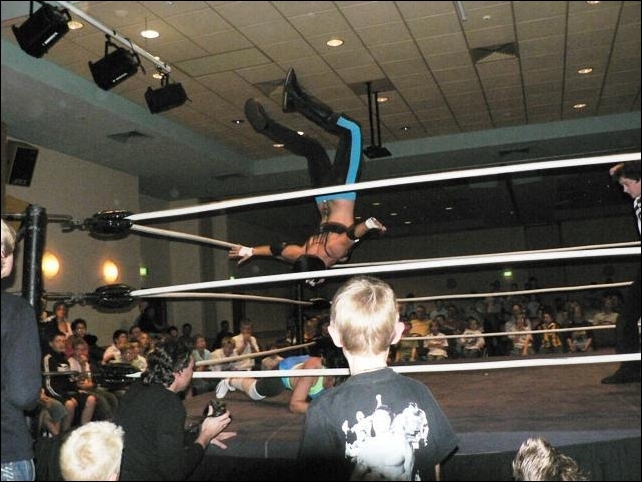 Biggest Win: Over Jessie McKay in a table match 17th May, 2008. I lost a lot of blood, but put her through the table none the less. Worst Loss: To Vixsin, at the first-ever PWWA women's event in Sydney for the chance at the PWWA Title. Favorite Type of Match: Any match where I can put someone through a table, chair or the barricades! Favorite Moves/Holds: "The Screaming Eagle Submission"; suplex off the top rope; stalling suplex; curb stomp. Finisher: "The Soaring Eagle" (springboard moonsault) or sitdown powerbomb. Biggest Allies: Ryan and Robbie Eagles because blood is thicker than water. And less recently, the Five Star Mafia that included Sean O'Shea and Mikey Broderick. Most-Hated Enemies: Any girl who gets in my way! Toughest Opponent(s): There has never been an opponent too tough for me! Favorite Wrestlers: Ryan Eagles. I would also have to say Eddie Guerrero and Owen Hart. Wrestling Ambition: I just want to be the best wrestler I can be. I love spending time with my daughter and husband.....I like listening to R&B, Hip-Hop and Rap.....I was a Surf Life Saver at one of Sydney's best beaches (Bronte Beach in Sydney) for five years.....I was a dancer for nine years.....I was very involved in athletics in high school: School Rep for Athletics (four years); School Rep for Diving (five years); School Rep for Artistic Gymnastics (two years); School Rep for Rhythmic Gymnastics (two years).....Some awards I have won: semi-finalist at the Australian Surf Life Saving Championships for R&R (Rescue and Resuscitation); second place in the State Rhythmic Gymnastics Compeition 2002, Trio 2nd Division; finalist in Star Australian Dancing Competition.....I was also a dancer at the 2000 Olympic Games Opening Ceremony! I will be wrestling again in the USA from August 26th.